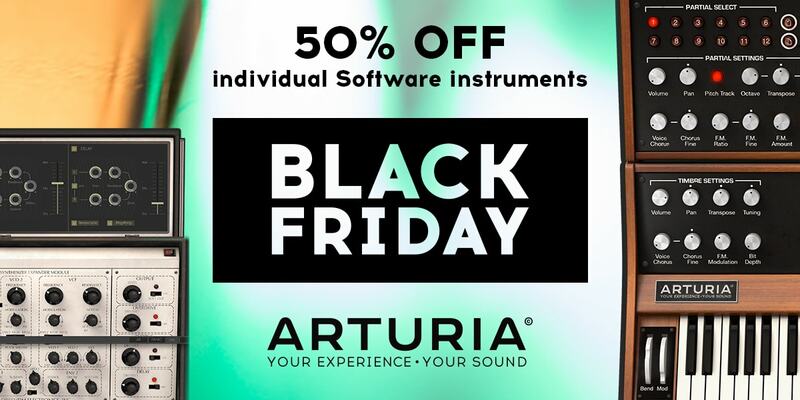 Until Tuesday 28th November 2017, every one of Arturia’s individual software instruments and effects is available for half price. Whether you need to give your tracks the warm push of an analog synth, the crunch of an overdriven organ, or the caress of a luscious studio grand piano, there’s never been a better time to take home one of Arturia’s award-winning software titles. Analog Lab 2 : a creativity launchpad with over 5,000 classic synth & keyboard presets. ARP2600 V : the super-versatile, semi-modular analog 70s legend. CS-80 V : Yamaha’s polyphonic supersynth reborn. Jup-8 V : the software reincarnation of the sound designer’s dream synth. Mini V : the iconic 70s monosynth reborn. Modular V : Dr Moog’s modular monolith. SEM V : the ultimate analog companion synth. Prophet V : 2 Sequential Circuits masterpieces reimagined as software synths. VOX Continental V : the finest recreation of the breathy combo organ. Farfisa V : the iconic sound of the 60s combo organ, regained. Wurli V : the versatile keyboard brought to life through physical modelling. Solina V : the string ensemble synth that started it all, back in the game. Matrix-12 V : Oberheim’s game-changer now at your fingertips. Stage-73 V : Fender’s iconic electric piano recaptured through physical modelling. Synclavier V : the impossibly rare digital masterpiece, recreated by the original designer. B-3 V : Hammond’s classic organ recreated through precise circuit & physical modelling. Piano V : the physically modelled piano suite. MiniFilter V : high quality studio effect modelled after Dr Moog’s famous filter. Spark 2 : a fully-loaded beat production studio.